This is the Mercedes-AMG A 35 L 4Matic, which is essentially the long-wheelbase version of the performance sedan that the company revealed in March 2019. Like the regular A-Class L Sedan, the A 35 L will be built by Beijing Benz Automotive, a joint venture between Daimler and its Chinese partner BAIC Motor. Compared to the A 35 Sedan, the A 35 L comes with a 60 mm gain in terms of wheelbase, with the final figure at 2,789 mm compared to 2,729 mm. Beyond that, the car is almost identical from every single aspect, as it still gets the AMG styling treatment at the front with a twin-louvre grille, AMG Line front apron with canards, and a front splitter. 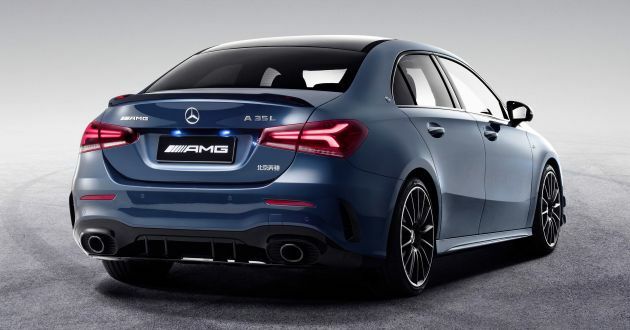 Around the sides, there are 19-inch, side skirts and dedicated AMG badging on the C-pillars, while the rear gets a diffuser insert and a spoiler lip on the boot lid, complemented by two round tailpipe trims. Some of these items are part of the standard AMG Aerodynamics package, while the AMG Night adds on black design details. Inside, you’ll still get a widescreen display linked to the Mercedes-Benz User Experience (MBUX) with dedicated AMG display styles. Other highlights of the interior include a choice of a standard AMG steering wheel or a Performance version – the latter comes with a rotary control with an integrated display. Buyers will also get to choose between two interior themes – classic red/black and titan grey/black. Performance-wise, the uprated M260 2.0 litre turbo four-pot serves up 302 hp (306 PS) at 5,800 rpm and 400 Nm of torque from 3,000-4,000 rpm. A seven-speed AMG Speedshift DCT 7G dual-clutch transmission sends power to all four wheels through an AMG Performance 4Matic variable all-wheel drive system. The increased sheet metal for the longer wheelbase does affect the zero to 100 km/h time, which is 4.9 seconds. That is one tenth slower than the standard-wheelbase model, or negligible for most people. The A 35 L is electronically limited to a top speed of 250 km/h. The five AMG Dynamic Select drive programmes – Slippery, Comfort, Sport, Sport + and Individual – are identical to the A 35. Mercedes Benz really improved a lot! 2.0 turbo can perform below 5 seconds with 300+ HP!!! Impossible. Only China can sold B, C, D segments long wheelbase sedan. Other countries only got E segment sedan for long wheelbase. I’m sick of this ‘ONLY FOR CHINA’term.. jilaka.. This yr for china… The remaining yr oso for china… Rich ppl around the world hv c-doll in china so this spice is doll gift. Previous Post: Lotus Evora GT4 Concept – 450 hp, 510 Nm machine!